The online poker landscape has undergone a plethora of major changes over the past 3 years. Since the United States passed the controversial UIGEA, it has become more difficult for the casual player to spend a lot of time and money playing online. As a result, on several of the major online poker sites, the player pool made up of a higher percentage of tougher players as opposed to fish. As the primary goal of a poker player is to make as much money as possible, playing against nothing but skilled competition makes this difficult. A serious player is better suited trying to identify the easy poker sites at which to beat players. With so many poker sites to choose from, finding the easiest to beat poker sites, is the single most important decision to be made. Of course, some people do play poker online in order to play against the best poker players in the world. However, if you are not up to task, this is a fast way to go broke. You want to find the fishiest poker sites for the maximum return on your playing time. Taking just a few minutes to go online and do some due diligence is the best way to give yourself the best opportunity to find weaker online poker players, or “fish”. You should make it easy on yourself and play against the fish as much as possible. One of the most dependable factors is whether or not a poker site also offers some type of casino or sportsbetting platform as well. When these are present, there is an increased likelihood that a recreational or inexperienced player will venture into the poker room to try to make some fast cash. Take for instance a person who has been winning a slew of football games on a given Sunday. All of a sudden, they have extra cash to spend. Rather than wait a whole week to bet on some more games, this person wants action, and wants it now. So, he innocently opens up the poker software and sits at a game against some experienced players who are just waiting for this fish. Before you know it, this player has just basically donated a couple hundred dollars into your virtual bankroll. By and large, most of the online professional poker players play at either Full Tilt Poker or PokerStars. If you are looking to be challenged, these are the sites to go to. However, if you choose instead a poker site offered by a sportsbook, these players are typically much, much worse and easier to beat. When perusing the easiest to beat poker sites, you also want to observe important statistics such as average flops and average pot and stack sizes. These are reliable indicators as to the skill level of your opponents. Large flops viewed percentages means that too many players are being involved in hands where they should be folding and make for easier prey. Additionally, large pot sizes and short stacks also mean that players are gambling it up and could be outclassed by thinking, more skilled players. If you follow some of these principles you will be better able to find easy poker games to beat on the internet. 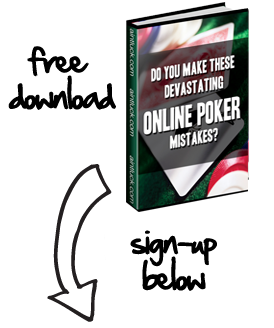 Identifying the easiest sites to beat is the most simple way to make money playing online poker. Now that was Easy!